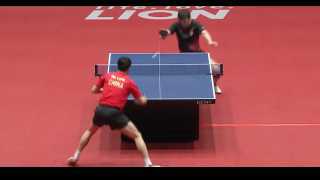 World's Best Table Tennis Robot vs TableTennisDaily's Dan! Thread: World's Best Table Tennis Robot vs TableTennisDaily's Dan! Spinny serves are probably the easiest thing for it to handle because calculating the rotation on the ball is quite easy with front on sensors alone, not even including the ones on the bat. The thing most difficult is to hit back anything fast and wide due to the limitation of how quickly the arm can move to position. To beat a world champion... Depends on how much they're willing to invest. I think we have the technology to do this already actually. The frame and movement capability need to be way bigger, the electric motors need to be way faster, the machine learning capabilities to develop and implement actual winning strategies already exist, though. But having a machine to accurately move large distances in that speed and time is probably the most difficult and expensive part. Developing an incredibly good bordering on impossible to return serve should be one of the easier to do, but would most likely need a specific motor capabilities just for serving to actually implement it. I doubt a robot like that will ever be affordable to any that isn't rich. A national team will probably be able to afford one will probably not buy one because people will be better. Why? People are more flexible and faster. I cannot see a TT robot replacing a good chopper. The machine will require lots of maintenance. The robot is fast but Dan was not really trying to hit the ball in a deceptive way or very fast. Dan was putting on a good show. There are some comments above that are very close to seeing the future. Right now the goal is to make a robot that can be the best. This is not necessary to have a huge affect on your life. What if the robots are able to be better than 50% of the people at doing a particular task? Then what? What do 50% percent of the people do? Making a robot that can perform better than 90% is not hard. There are two industries I am very familiar with. Both involve scanning raw material and then removing defects or cutting the material to get the most out of of the raw material. This has been happening since the 1980s. I have seen lots of people be replaced by machines that are much faster and accurate than people. There is no way for people to compete. So what is your attitude toward AI? Imagine decades later some people may not be able to survive just because robots takes all the "easy" jobs. No. The body is not taken into consideration. The racket has sensors on it and there are multiple cameras. Additionally the trajectory, spin and velocity of the ball would be calculated within 2mm of the ball leaving the rubber. The machine would have estimated it alone from the racket sensors and the incoming (to the human) ball parameters. If it is learning to develop winning strategies then playing against itself (in a simulated 'software' environment) is exactly how it would learn. It's actually the only way. I suspect that the way this machine works is not based on machine learning though, I think the movements are logically hardcoded. Having sensors on the bat make that obvious. Kind of like deepblue as opposed to alphazero. I believe it has a small training component which has the ability to optimise in certain circumstances, whether or not it does it on the fly, is anyone's guess. And I doubt that component is any more powerful than what you find in your smartphone. Seems you are pro in robots and AI. I wonder, if the robot calculates the spin and drop point only according to the trajectory o f the ball, how long (time) and how far (the length of the trajectory) does it need to do the calculation (with no limitation of cameras)? You are 100% correct. Machines are faster, more accurwte, better than humans. Machine learning is smarter, faster, more accurate than humans. We, as humans, should embrace it and use it to make our world a better place. Right now the machines for this project are more expensive than humans, but not for long. Don't rule out a world champion beating robot in the near future and an 'affordable' perfect training partner shortly after that. To beat a world champion, a robot must learns to attack. I cannot see any sign of the ability for a robot to perform attacking. (AS you said, this is difficult.) Although it is theoretically possible to beat a world champion only by defensing, what is the point of that? People would like to see a real "violent" game between human and a robot. The I doubt it would take a millisecond. Much depends on the CPU power but the problem can be divided up among X, Y, Z coordinates. However, there is a lot of calculations that must be done. First one must take into account the frame rate of the camera. Lets assume the frame rate is 100 FPS. This is 10 ms per frame and it takes about a second to for the ball to move to the other side. I was watching the speed indicator on the net and it was saying 3 to 4 meters per second. So would need only about 100 iterations between when Dan hits the ball and the robot hits the ball. There is no need for to do this unless trying to predict the ball's trajectory or better yet, to pick a location for the ball to land and minimize the time it takes for the ball to get there. This may take more iterations but it is easy to do. This would be necessary to compute the paddle impact speed and attitude of the paddle. If the robot can pick where to land the ball and minimize the time of flight, the next step can be taken which is to chose the best place to land the ball to be most difficult for the opponent. I think this qualifies as attacking. If the robot knows the in coming spin then it will be able to correct the angle of the paddle rather than just assume the ball will bounce off the paddle like a mirror. It would be interesting to know what kind of rubber the robot was using. This data can be learned by trial and error. It would also need to update or tweak these parameters as the ball or rubber changes. I have done the calculations for the trajectory of a TT ball given an initial speed, angle from horizontal and spin. These three parameters would need to be adjusted to find the values that allow the ball to land at a desired distance. Flatter trajectories will take less time but will also be riskier due to passing over the net with small margins. This would be a fun project. I don't think the limitations are due to software or processing power. It think the limitations are mechanical. I think it's the bandaid stuff I mentioned. I can't think of any other way it can do it on the fly. But bandaids come at the cost of computational efficiency. It's like having a different set of rules for every situation. And that number of rules is 'exactly' infinity. The problem is whenever a mistake happens, the model will slightly adjust, or converge to the minimum possible error, but the machine won't actually know if the model has moved in the right direction (the direction of minimum error) until the machine sees the same example again. And it won't just need to see it again, it'll need to see it thousands more times for it to 'learn' or to converge to the minimum achievable error. It is unlikely that the machine will make an error and just correct it straight away. It is quite difficult for it to learn this way based on machine learning techniques because if it is to make such a large change it will most likely overcompensate. Their robot is far from this level of autonomy, though. A simpler explanation would be this. The term 'AI' is very broadly applied by the Omron guy. It is possible that when a mistake is made it is assessed by the sensors (incoming and outgoing spin, velocity, trajectory etc) and then if it can calculate why the error occurred, it can make suitable adjustments for these situations. The thing is, some would no longer consider this 'machine learning'. Anyways there are some areas of AI applicability to our beloved game that I would like to explore, possibly if the AI could help figure out or give more insights into the game itself, just like Alpha Zero did for chess. There was this scientific paper 2-3 years ago on the ittf site about how ball and net size could affect the game. They used some computer models and try to calculate the "spectrum" of successful trajectories, I'll try to find it over the weekend. What this machine can accomplish with Dan is amazing! Even it looks clumsy at best. Whether the machine or similar can evolve into a ML killer will remain to be seen. I doubt it can happen soon as there is not much interest in table tennis like in other sports. But to be fair to human being a robot should be built based on human form (legs, arms, body, head), right? Fair? Humans don’t have electromotors, inexhaustably provided with energy, either. Take two humans, and there will be physical differences. We seem to accept that, if we don’t ignore it altogether, without crying foul or calling for fair. Yet many do when performance enhancers (often mere placebos) are applied. Strange beasties, these humans. Last edited by yoass; 4 Days Ago at 05:54 PM. The robot has some advantage because the racket is near the net. And lower-latency feedback sensors, higher agility and power, near-absolute reproducability etc etc. ; it has sensors galore, even on Dans racket to boot. Limit it to with two cameras, too close to each other for easy depth interpolation, one slightly slower and darker than the other; and slightly out of focus, a very narrow focus spot and an erratic peripheral vision subsysten, and a few optical other funnies added to the mix: blind spots, cylindrycal distortions, and then we’re talking! But that’s only one school in AI, that seeks to model human abilities by trying to build system doing things the way a human does, rebuilding component by component. There’s also another school, that lets go of all that and just looks at the task at hand. Deep Blue and Gary Kasparov did not play the same game in the same way, the first school would maintain. To the second school that does not matter. Actually this video just strengthens my view that there won't be a table tennis robot good enough to beat a WTTC champion in a looooooooooong time. Maybe never (but you should never say never). This robot is impressive from a constructioner's point of view but seeing the robot as a table tennis opponent... he is very weak.